This is a really pretty 1997 Marilyn Monroe Blonde Barbie Doll, mint, unused condition in the original box made by Mattel. 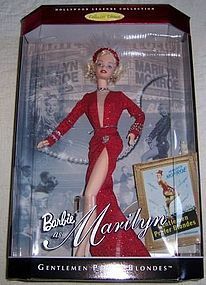 This doll features the movie Gentlemen Prefer Blondes. This Collectors Edition Barbie is part of the Hollywood Legends Collection. This pretty doll has a really pretty red dress with accessories. The box is in very good condition with no damage. Be sure to search our other dolls available. We guarantee all items to be as described. Feel free to email with any questions. THANK YOU.